As a frequent road traveler to Alwar starting early morning from Delhi, I often make a pit-stop at Dharuhera, Rewari for breakfast. 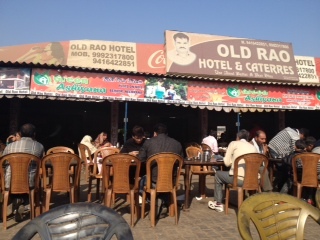 NH-8 is dotted by several highway dhabas, and the most common name among them is ‘Rao’ with different prefixes & suffixes. The most authentic and oldest one is called ‘Old Rao Hotels & Caterers‘, which is 24 X 7 super busy joint and its parking lot is filled with small and big cars. It’s a large yet simple eating joint with plastic tables and chairs, and an open kitchen, and you are not going to find the servers in neat uniforms. However if you are looking for some fresh and hot food desi style, this place offers good value for money. I have had numerous breakfasts and have tried them for a few dinners too. 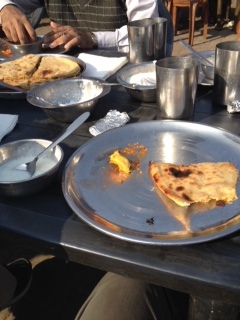 The dishes that I always stick to here are Aaloo Paranthas & Curd for breakfast, and Butter Chicken & Naan for dinner. Their stuffed bread offerings are good and mouth watering. Breakfast for four would cost around Rs 500. Does it serve non veg food? Yes, Manas. And delicious too. Try Butter Chicken with Naan. Thanks, Manu. We are planning to have lunch tomorrow. is dhabhe mein khana aur service bhaut hi achi hai,adrak wali chai ka to koi jawab hi nahi hai,lekin 25th june 2014 ko inke menu card mein hi fark tha brakefast mein aaloo paratha rs.30 tha aur same menu mein back page pe aaloo paratha rs.35 tha aisa kyu? kahi aisa to nahi yeh bhi dhabha dusre dhabho jaisa ho raha hai. aur customer ko menu card bina price wala hi menu card hi kyu dete hai?, mangne pe hi price wala menu card kyu dete hai?isliye bill mein price check karna padta hai. yeh kami nahi ho to is dhabhe ka koi jawab hi nahi hai. 05 august 2014 bhi wahi problem, classic cigareette ke pack jis pe MRP:170.00 tha. uska 200.00 liya. bill mangne pe badi mushkil se bill diya ,uspe bhi description OTHER print tha, baad mein cash counter wale ne pen se cigareette likh kar diya.